Anger is a spur of the moment and emotionally impulsive reaction which all of us experience at some time or the other. This post is meant for all who have been the source or victims of anger at various times and situations at the workplace and shows you 5 practical ways to proactively take charge of our temper. It is always easy to use high-sounding words like Anger Management, stress filled life, angry exchanges and similar expressions. But before we talk about Anger Management, we need to know what anger is all about. One way of finding how anger affects our daily life is to look at instances of anger that are always situation-centric. When someone breaks his/her promise with any lame excuse. When someone comes late or does not come at all after a committed appointment. A high performance executive selected to make a presentation to top management absent with no notice resulting in loss of face and reputation. When someone takes credit for your work. If I am working and someone talking me continuously and waste my time. When an employee resigning abruptly within a few weeks of joining causing a major setback to execution of plans. The different instances of anger in the work place that I have highlighted above show that expression of anger as an impulsive emotion is situation-centric. 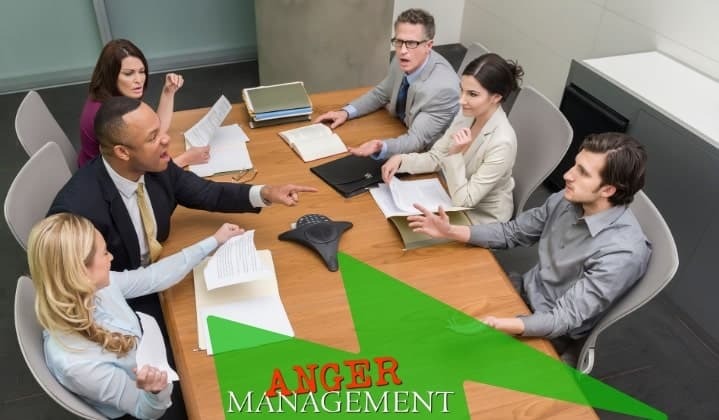 This post looks at anger in the work place and what you can do to control your temper and help create a happier and more productive work place for all employees. You, who has taken the time and effort to search for and access this how-to guide on controlling temper in the work place, would readily agree that all of us are equally guilty of losing our temper at different times. Anger as impulsive emotion takes place on a person to person level whether at the work place or in any other social setting. In line with the explosive nature of this emotion, we need to look at a practical definition of anger. Why a practical definition of anger? The definition needs to be practical because we need to understand why instances of anger are becoming frequent. Likewise, in a corporate setting and on a personal level also, we need to know why we tend to “blow our top” or lose our temper over situations that we would otherwise handle in a cool and level headed manner. To my mind, one practical definition of anger could be, “Impulsive and negative reaction to people, situations and incidents that are perceived to have hurt us”. In practice, the display of anger may manifest itself physically (including violence that may lead to physical harm), vocally (abusing/using bad language, shouting, screaming or yelling) or in some cases, mental harassment (sending verbal or text messages or images leading to extreme anguish or traumatic experience) in order to hit back at the perceived source of anger. Anger is an uncontrolled, negative reaction or response to incidents, situations or people around us. This reaction indicates that some situation or incident has taken place that is a trigger to the angry response. Impulsive nature of anger indicates that anger is a spur-of-the-moment reaction. Perceived brings in the personalized nature of anger which may be right or wrong. In other words, a situation or incident that causes one person to get angry may not cause anger in another person. This definition of anger has helped me to show you five practical ways that can help all of us to control our temper and improve the comfort and feel good factor of our workplace experience. The tips I have shown can help you to channelize & productively harness negative emotions to your advantage. The right time to stay cool is exactly when tempers are red-hot and your colleagues are involved in a “shouting match”. You may be as much responsible for the football of angry emotions. All the same, you, as one of the active players in the shouting match, could decide to take control of the situation. By adopting a more reasonable approach and persuading others in your team to do likewise, you could be successful in deflating the angry impulsive balloon of anger. This way you ensure that you get a firm handle on the situation. The watchword for you and your colleagues is “Stay Cool”. As part of your daily workplace interactions you could face situations that may lead outbursts of temper. There could be tension between some employees involving you also. It is exactly in such situations that you need to hold back your words which may not be easy but which you need to do to ensure that the situation does not go beyond control. Resist the temptation to instantly speak out your mind and to react to situations and incidents on the spur of the moment. Give yourself that valuable and much needed pause. Much to your own surprise, you may find that the tense moment of angry exchanges may be gradually peaking out. As a result of your initiative to think before you speak, the active participants in the “shouting match” may be willing to discuss matters in a more receptive frame of mind. The triggers are in practice the way you and your colleagues react to day to day situations and incidents involving their workplace. The triggers may lie within you or in your colleagues around you. If one of your colleagues or your boss is rude and loses his/her temper then it is best for you to minimize your interactions with them. In some cases, the triggers may in fact, lie outside the work place such as reaching office late due to traffic jams leading you to lose valuable time to give a head start to your work. One trigger for nasty tempers could even be the layout of the collective workplace. In short, review and list out triggers causing tempers to flare up at work. You could share the list with your colleagues to ensure that they are also equally aware of the triggers and are better prepared to take pre-emptive as well as preventive steps to at least avoid, if not eliminate tempers from flaring up. Start looking for solutions to the problem that may have lead to the situation causing tempers to flare up in the first place. Many times angry responses happen because, without realizing it, we are focused only on the problem that caused angry exchanges and “hot words” between persons involved in the verbal fistfight. The outcome is that tempers continue to flare up as the problem that caused the angry response is not resolved. The problem may be in the interactions between your colleagues, in the work processes /work flows or could even be external to the work place. Hold an informal meeting to understand the problem, in fact, if there is a problem at all, as it could be a case of misunderstanding or wrong interpretation of instructions. Adopting a problem solving approach could help you and your colleagues to be in charge of situations and incidents likely to lead to angry exchanges. As soon as you notice angry exchanges involving you really flaring up, just leave the place and physically disconnect your presence. Leave your workplace for a few minutes, call a friend or do some deep breathing to get a handle on the situation that has the potential to be explosive and go out of control. A more personalized approach would be to look yourself in the mirror with anger written all over your face. Is that the kind of face you want to project about yourself? If the answer is: Absolutely NO, then release the tension ASAP and your face will also reflect the relaxed look. I want this post to be a practical how-to guide to manage your anger. Through this post I want to highlight the destructive nature of anger and how anger has the potential to destroy your personal, family, social and professional life, if we do not take timely steps to manage anger NOW. I want to bring Anger Management into the public domain where it should rightly belong because anger is public expression of impulsive emotion with highly negative consequences directed outwards at other people or at situations. If you have noticed anyone who gets angry quickly or who is a victim of such anger then I want you to forward this post to your family members, friends, colleagues and business associates to control his anger. Take the initiative to spread the word that managing anger is everyone’s priority number one mainly because of the destructive nature of this highly negative emotion. You will be doing a much needed service to them because, it seems to me that until now, articles, research studies and similar coverage about anger and anger management are mostly restricted to professional journals , websites and academic sources. After this post, that will not be the case anymore. I want this post to attract more and more eyeballs and hits in the larger interest of my readers. Reading this post means that more people want to be in charge of their emotions and not allow the destructive power of anger to rule and ruin their lives. Thanks for the post and will make sure to work with it. Thank you for a very practical approach in analysing and providing solutions for anger management.